In March 2014, I posted a note entitled, Why So Paranoid About Canada's Housing Market?, in which I argued that the housing market in Canada's least affordable cities, Vancouver and Toronto, did not seem overvalued relative to other major cities such as Hong Kong, London, Beijing, Singapore, Moscow, Sydney and Melbourne. More than two years later, that conclusion has been borne out, as the Vancouver and Toronto housing markets did not experience sharp corrections, as many were forecasting, but instead posted strong further price gains. Global central bank policies of low interest rates and massive liquidity provided by quantitative easing have affected all global housing markets, pushing up the value of real assets such as houses relative to the value of money. When central banks withdraw from their extremely easy monetary policies, housing markets in all countries may experience a slowing or a more serious correction. But there is no reason to single out Canada, as the Financial Times did, as “the next global housing market ready to burst”. 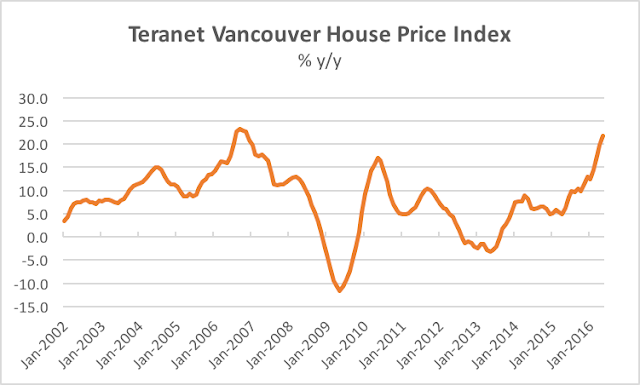 In this post, I want to further highlight how the spillovers from other countries monetary policies have affected Canada's most overvalued housing market, Vancouver. There is no doubt that Vancouver's house prices have moved deeply into bubble territory. 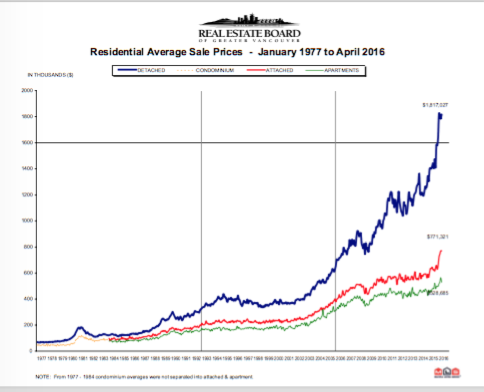 The chart above, from the Real Estate Board of Greater Vancouver, shows that the average price of a detached home in Vancouver has surged by over 30% in there past year to over C$1.8 million (for a clearer view of this chart click here). The epic surge in Vancouver prices pushed RBC's affordability measure for the Vancouver area to 87.6 per cent in 1Q15, the worst ever recorded anywhere in Canada. The annual pace of increases in Vancouver house prices since 2002, as measured by Teranet, is shown in the chart below. Finance Minister Bill Morneau recently promised that his department was undertaking a "deep dive" into Canada's housing markets to find "real evidence" behind the country's red-hot sector and the role of foreign investors in those record-high prices. Bank of Canada Governor Steven Poloz said this month on the release of the Financial System Review (FSR), that "We are also seeing evidence, particularly in Vancouver but also in Toronto, where expectations of future price changes have become, to a degree, extrapolative and we think that those expectations are probably not going to be realized. The rate of price increase in those markets has been outpacing fundamentals and therefore would be unlikely to be sustained". In the FSR, the Bank of Canada acknowledged that "foreign demand is playing a role in specific sectors of the Vancouver and Toronto housing markets", but noted that the effect is difficult to measure because of the lack of data on foreign home purchases and ownership. Participants in both housing markets and financial markets so far have shrugged at these comments. The frenzy to buy homes in Vancouver and Toronto shows no signs of abating. Financial markets are pricing in no greater likelihood of Bank of Canada tightening policy to cool housing markets, as the economy continues to operate below full capacity and growth prospects remain lacklustre. Why are Vancouver Prices outpacing "Fundamentals"? Both Morneau and Poloz noted that fundamentals such as immigration, job growth and income growth are stronger in Vancouver than in other parts of Canada. However, these relatively strong fundamentals cannot explain the strength of house price growth. The unanswered question is why are Vancouver house prices stronger than the fundamentals? Poloz suggests that it is because buyers, sellers and lenders seem to have adopted extrapolative expectations, extrapolating the current pace of price gains into the future. But why have price expectations exploded in these cities and not in other parts of Canada? In my opinion, the housing markets in Vancouver and, to a lesser extent, in Toronto are responding not only to the extraordinarily easy monetary policies being pursued by the central banks of the US, Eurozone and Japan, but equally importantly to monetary policy in China given the relative ease with which residents of mainland China, Hong Kong and Taiwan are able to purchase real estate in Canada. When the Chinese government wants to provide stimulus to the economy, it does so by encouraging Chinese banks to increase loan growth for a wide range of activities. When loan growth surges, Chinese house prices tend to post strong gains; and when Chinese house prices post strong gains, Vancouver house prices tend to do the same. 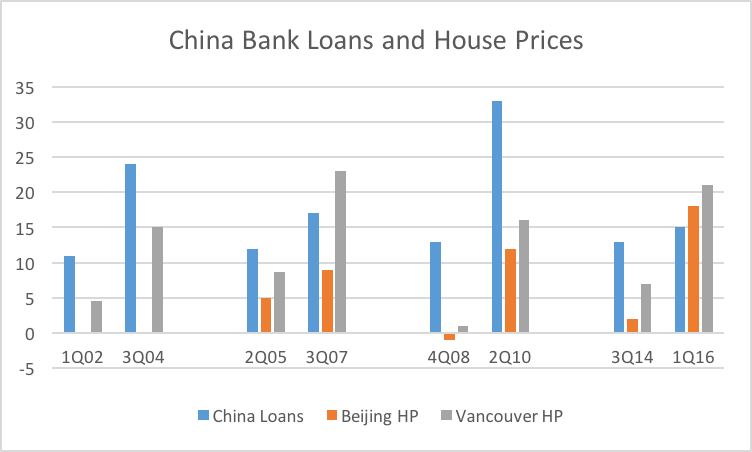 The chart below shows four periods in which China loan growth has accelerated, and the behaviour of house prices in Beijing and Vancouver (Beijing data not available for the 1Q02-3Q04 period). The chart shows that in the period from 2Q05 to 3Q07, as the US housing bubble was forming, China loan growth accelerated from12% to 17% y/y, Beijing house prices accelerated from 5% to 9% y/y and Vancouver prices surged from 9% to 23% y/y. 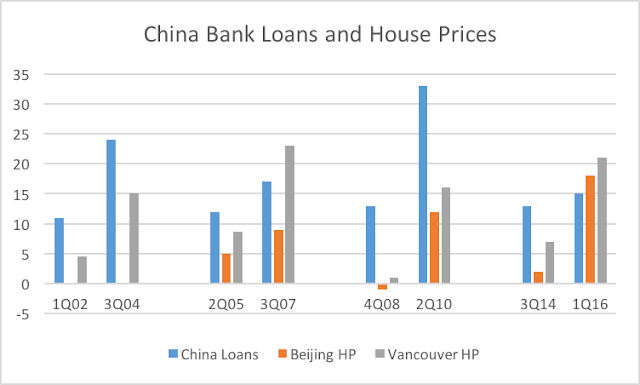 In the period from 4Q08 to 2Q10, in the wake of the Global Financial Crisis, China loan growth surged from 13% to a peak of 33% (in 4Q09), the price of homes in Beijing went from a decline of 1% to a rise of 12% y/y, and Vancouver house price gains rose from 1% to 16% y/y. In the most recent period, from 3Q14 to 1Q16, a period when China has seen two stock market crashes that have driven nervous investors away from equities, China loan growth has been boosted through stimulus measures from 13% to 15%, as the increase in bank loans hit an all-time record in January. In response to the stimulus, Beijing house price gains accelerated from 2% to 18%y/y and Vancouver house price gains jumped from 7% to 21%. It is worth noting that prices in other big cities in China surged by even more, to over 20%y/y in Shanghai and over 50% y/y in Shenzhen. It is also worth noting that because the Chinese Yuan (CNY) appreciated by about 11% versus the Canadian dollar over the period, Vancouver house prices actually became more affordable for Chinese buyers (in CNY terms) relative to homes in Beijing, Shanghai and Shenzhen, even as homes in these cities became much less affordable for the majority of both Chinese and Canadian citizens. As financial strains have increased in China, there seems little mystery in where much of the government stimulus ends up. It flows from banks through both state-owned and private enterprises to senior officials and highly paid employees and then into home buying, both in major Chinese cities and in cities abroad that are attractive places to own property (although not necessarily to live) and for their children to be educated, such as Vancouver. This process has been well documented in David Ley's insightful book, Millionaire Migrants: Trans-Pacific Life Lines. Canadian governments -- federal, provincial and municipal -- have been actively encouraging this type of foreign investment since at least the late-1980s. While Mr. Poloz is probably correct to say that Vancouver house price expectations have become extrapolative, that the pace of recent price gains in unlikely to be sustained and that the risk of a potentially sizeable house price correction has increased, there is little that the Bank of Canada can or should do about it. As long as global central banks continue to pursue reflationary policies at any cost, keeping policy rates near zero or even negative, and willing to encourage high rates of credit growth even as debt ratios reach new highs, the Bank of Canada cannot raise rates to lean against the housing bubble without further appreciating the Canadian dollar and stifling the export-led growth that the country needs. While Poloz is correct that financial stability risks are rising as Vancouver and Toronto house prices grow to the sky, it is the job of Finance Minister Morneau, along with provincial and city officials, to decide what measures might curb the influence of foreign central bank stimulus on Vancouver and Toronto house prices and how these measures might be applied without bringing about the sharp house price correction that everyone fears. This is also probably one of the reasons why what worries the Bank of Canada even more than housing is a concern about financial stress in China.